CDW Managed Services let you focus on growth, not maintenance. The technology that supports your organization needs support of its own. And the more time your team spends keeping things running, the less time they have to move your organization forward. At CDW, we can help you manage your most complex infrastructure and applications with holistic, secure solutions. We can tailor our services to your goals and identify the service level that meets your needs and budget. And with our experts focused on orchestration, your IT staff will have time to pursue initiatives that can give your organization an edge. Give us a call at 800.800.4239 to learn more about CDW Managed Services. CDW Managed Services helped Briggs & Stratton's IT team free up time spent on routine infrastructure maintenance to focus on innovation and strategic business goals. 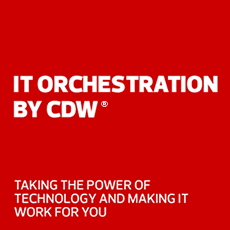 A trusted partner like CDW can deliver essential technology services that reduce costs and improve performance while reducing the burden on IT staff. Cloud services are fast becoming a standard part of IT delivery. Managed services that complement your virtual infrastructure are often the lynchpin to success in the cloud. To reduce the burden on your staff and ensure business continuity, CDW leverages data centers that are cross connected to high-performing cloud solutions. These data center ecosystems are privately networked via Low Latency Transport to provide the performance and security your business requires. CDW wraps these world-class assets in our managed services to deliver a seamless experience through two Enterprise Command Centers. We felt the need for data center agility and scalability for growth. Expanding our cloud use would also simultaneously help control costs. To achieve TaylorMade’s vision of a scalable DR environment, we needed to look beyond colocation, so we focused on DR as a Service and cloud services. We can help you streamline operations throughout your organization. Our managed services team helps put the right people, process and tools in place so you can operate as efficiently as possible. Avoid costly downtime with support where you need it most. Our experts will implement key policies and deliver 24/7 coverage to keep your systems running and reduce the risk of failure. Free from the burden of everyday management tasks, your IT staff can focus on ways to create better experiences and move your organization forward with the latest technologies. Call us at 800.800.4239 to learn more about CDW Managed Services.